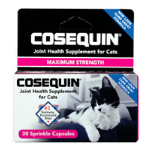 Cosequin® is the #1 veterinarian-recommended retail joint health supplement brand. You and your veterinarian want the best for your pet, and Cosequin is here to support that effort. Cosequin is formulated with a trademarked combination of ingredients.